Every day when I walk my dog, I pass by a donation box outside a dusty old liquor store. It’s been there as long as I can remember. When you start looking around, you’ll see these big metal boxes all around town. They’re never too far. And while it’s great to donate clothes, shoes, towels, or toys you can’t use or wear any more, there’s another benefit for you: clearing clutter improves your mental clarity. I’ll explain why it might be time to grab some plastic bags and schedule a date with your closet! Reading The Life-Changing Magic of Tidying Up by Marie Kondo was eye-opening for me. The theory is: if you surround yourself with objects that truly make you happy, you’ll feel happier all the time. Further, keeping things that don’t make you happy can actually make you feel worse. It’s important to ruthlessly declutter – your mental state depends on it. TOSS. IT. In a bag. And donate it. You won’t wear it again. If you no longer love the item, discard it. Unemotionally. Just get rid of it without thinking about it again. This applies to everything in your living space! When you’re done, you’ll likely have a few bags of old clothes – and a closet filled with items you truly love and are excited about wearing. When you donate, the clothes are used at missions, homeless shelters, orphanages, and other social programs. Others will be excited to take things you aren’t in love with. It will help them mentally, too – by giving them the confidence to re-enter society, apply for jobs, or make new friendships. And with more room in your closet, you can use the power of intention to fill it with things that bring joy to your life. Everyone wins. And best of all, it’s all free. Pick a day, get up early, and grab some bags. When you’re done sorting through old clothes, drop them in a big metal box like in the photo above. It’s an easy way to help someone else. It costs you nothing. And everyone wins by getting a boost of happiness. If you need more inspiration and tips, I highly recommend The Life-Changing Magic of Tidying Up. It changed how I think about the objects in my home. Start a revolution of good. 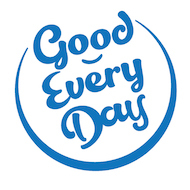 This is an easy and beneficial way to do good every day. Putting more good into the world.